Call it a salad or call it a meal, I call it dinner-under-20-minutes! 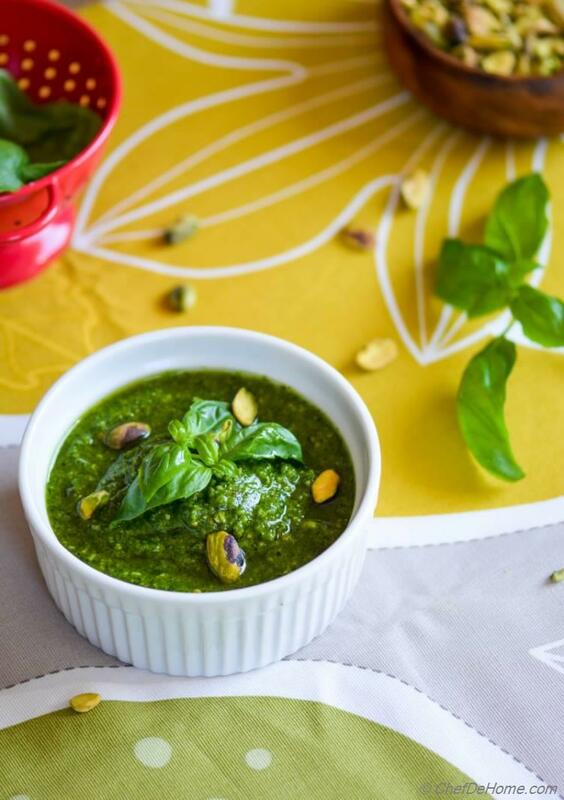 Who does not love nutty, rich, and aromatic taste of basil pesto? 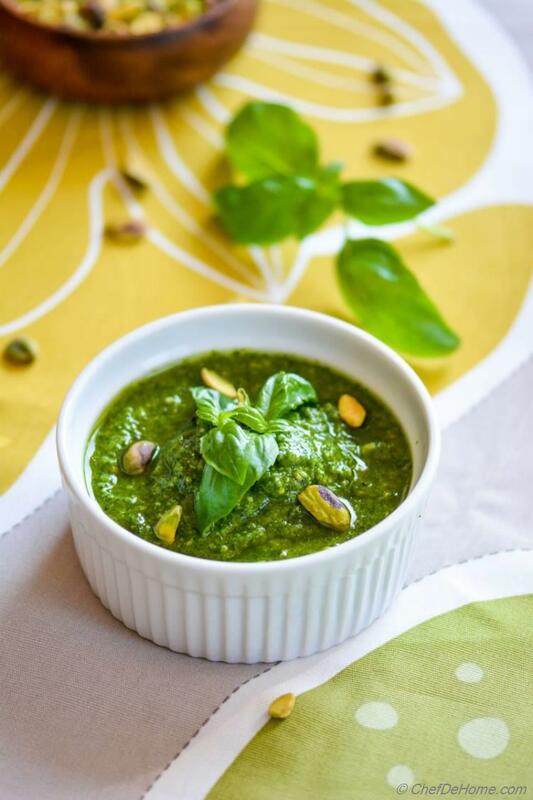 If you are new to pesto, Basil Pesto is a flavorful basil sauce (or paste), made with olive oil, basil, garlic, grated hard cheese, and pine nuts. 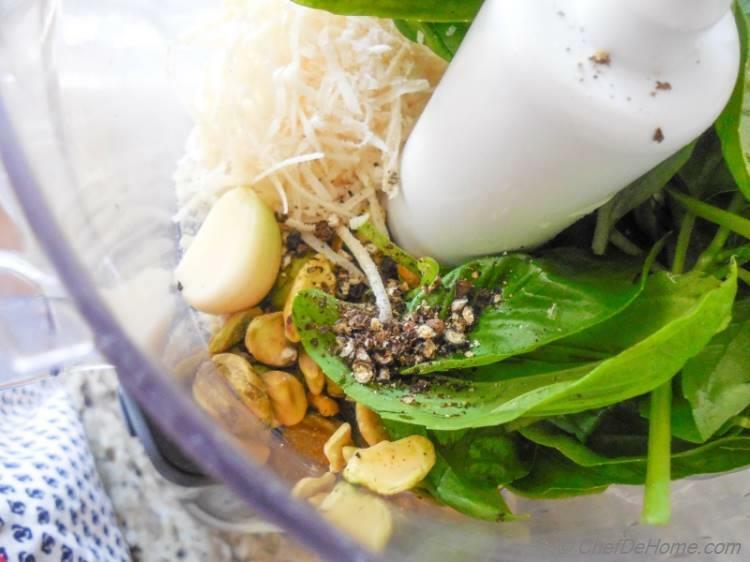 A few simple ingredients to make a delicious basil pesto at home, in less than 5 minutes. But... there is one catch in making pesto at home..... traditional pesto uses pine nuts which are always priced high. So..... to make pesto economical, I started replacing classic pesto ingredient - pine nuts, with other raw nuts like walnuts, and very recently with pistachios. I really love the nutty and rich bite of walnuts in basil pesto..... I have to say, pistachios also add very rich and distinct nutty taste. 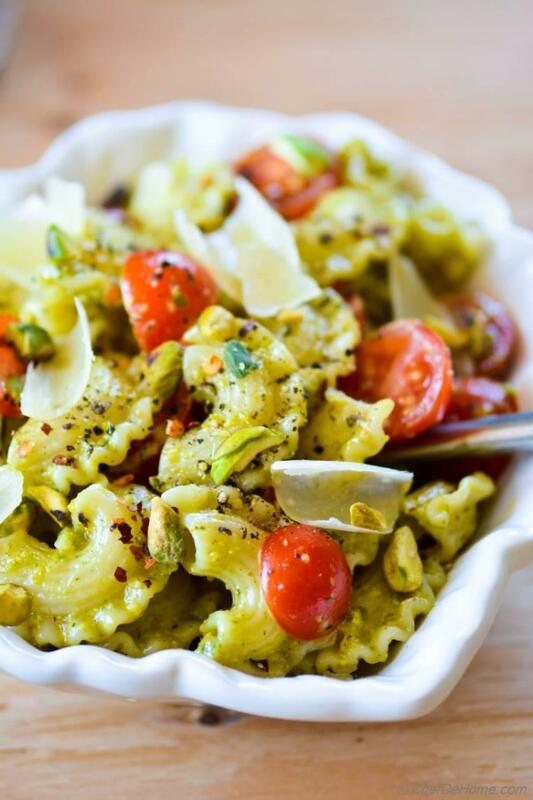 Plus the green color of pistachios adds to the gorgeous green-hue of basil and olive oil. 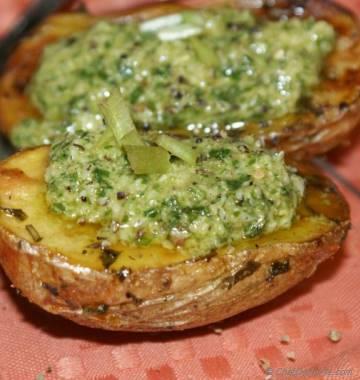 Above all, you will NOT miss pine nuts in pesto for an instance! Every few weeks, we bring some fresh basil home (if I our basil plant is not growing enough basil!!) and then, I always make sure to have a batch of pesto before basil leaves get dark or dead lying in refrigerator. My Pesto recipe repertoire has evolved a lot since I bought a basil plant and started making pesto at home. 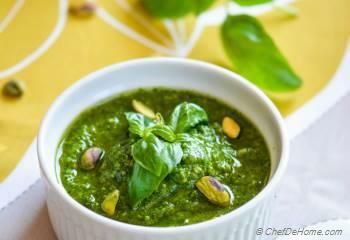 Feels like yesterday, when I shared Classic Basil Pesto Recipe with you (around 3 years ago). 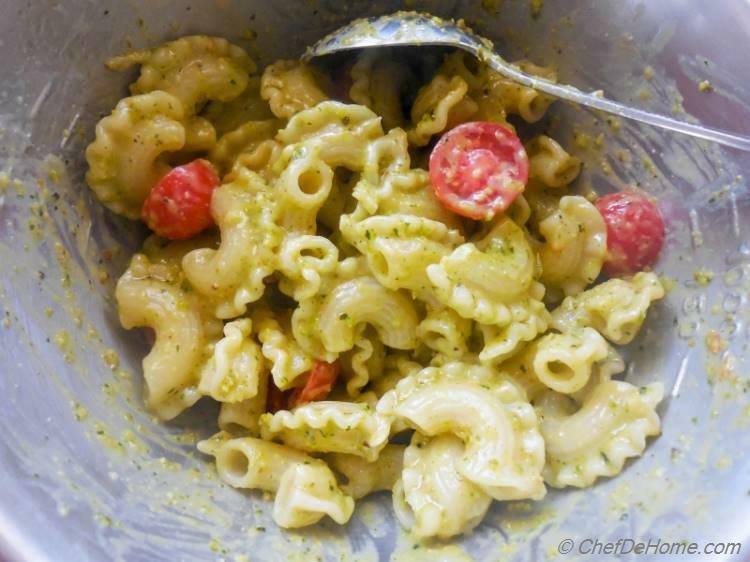 Not just for salads, pastas, or crostini, I love using pesto in pasta salads and even as topping for Rustic Baked Potatoes. 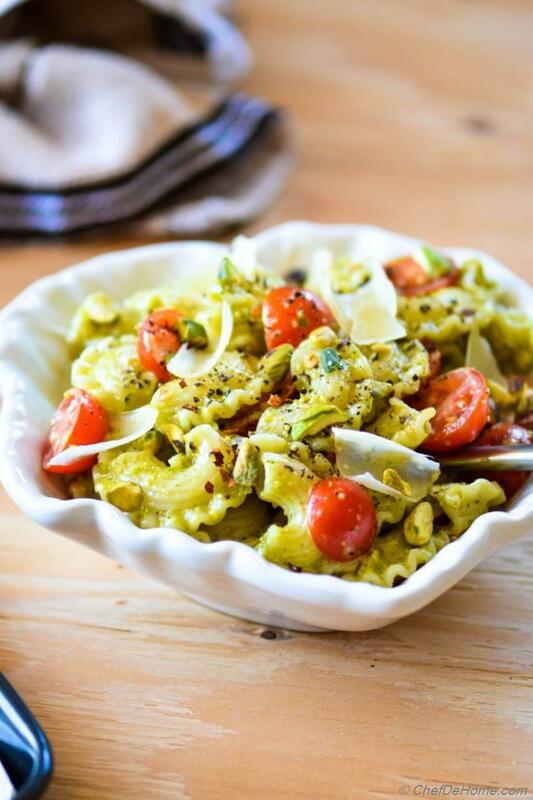 Sharing with you today, fresh pistachio basil pesto and one of my recent way to make pasta dinner, for both us, under 20 minutes! i.e. 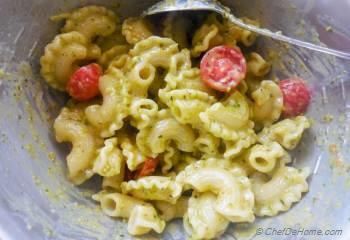 simple yet full of flavor, Pasta slathered in quick garlicky Pistachio Pesto Sauce. So, I strongly recommend perfuming the oil with just one chopped garlic for few seconds, then add to pesto before coating the hot pasta. Serve and enjoy!! Happy Cooking and keep visiting ChefDeHome! Total Time 18 minutes Prep Time 8 minutes Cook Time 10 minutes Difficulty Easy Yields 2 Servings Serves 2 Notes Pesto yields about 1 cup, pasta recipe uses only 1/4 to 1/3 of pesto. Smart Swap For better health, use wholewheat pasta instead of refined flour pasta. 1. Bring water for pasta to rolling boil. Season with salt. In boiling water, add pasta and cook per package directions (about 8-10 minutes or until al-dente). 2. 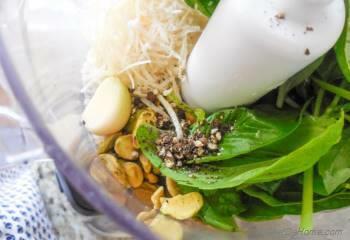 In food processor jar, add pesto ingredients except olive oil. 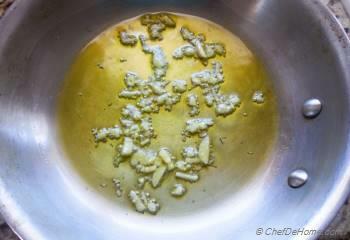 With motor running on low, add olive oil in slow stream until pesto is fine pureed and creamy. Taste and adjust seasoning. 3. While pasta is cooking, remove pesto from jar, transfer 1/3 cup to a wide bowl and keep rest refrigerated in air-tight container for later use. 4. Warm olive oil in a shallow pan, add chopped garlic and let it perfume the oil (30 seconds). Don't let garlic burn or it will taste bitter. 5. 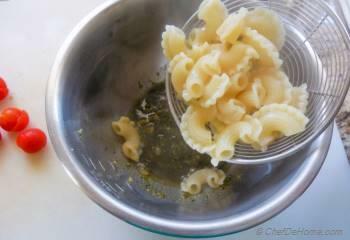 Pour oil over pesto, also add cooked hot pasta, grated cheese, and toss to combine. Make sure parmesan is either shredded or fine grated. Fine grated parmesan will adhere very well to hot pasta tubes with pesto and oil and create a very balanced taste experience. 6. 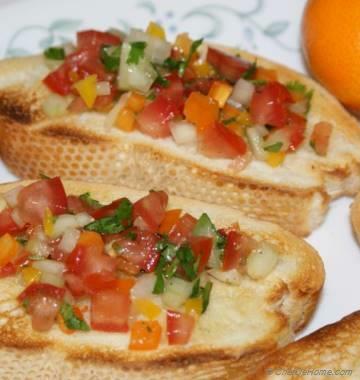 Now add sliced cherry tomatoes over the top. Gently combine until pasta is fully coated in pesto and oil. Taste and adjust salt and black pepper. 7. Serve warm or at room temperature. Garnish with some chopped pistachio and shaved parmesan before serving. Enjoy!! 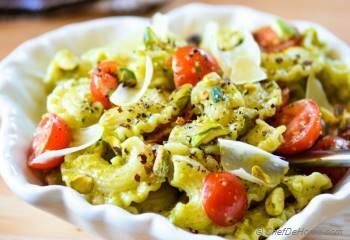 Pesto pasta taste great at room temperature or cold too. Add some lemon juice, sliced bell pepper, oranges to make cold pesto pasta salad. 1) You can also use spinach instead of basil in this pistachio pesto. 2) I often use crumbled feta cheese instead of parmesan while making this pasta. Feta might not be a classic ingredient in Pesto but it's salty taste really compliments rich Pesto Pasta very well. 3) Use whole wheat pasta to avoid some refined-flour calories. 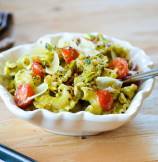 4) Use Buckwheat pasta to make GLUTEN FREE pesto pasta dinner. Yummy in my tummy! loved every bite of pesto and pasta yesterday. 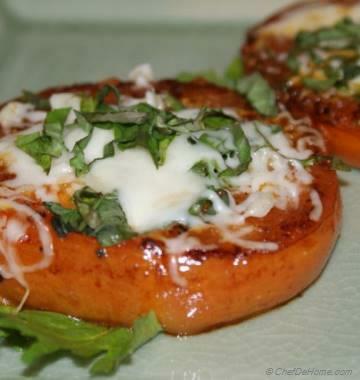 Savita, thanks for sharing awesome recipe.